Folio (440 x 315 mm.) 24 leaves of printed text (verso’s blank), of which 2 leaves preliminaries and 22 leaves descriptions of the plates. Elaborate engraved frontispiece of St. Francis by Domenico Falcini, letterpress dedication and preface, 22 engraved plates by Jacopo Ligozzi and Raphael Sciaminossi, each printed on one side only and facing letterpress explanations within typographic border; plate A is printed on 3 leaves, plate D on two leaves, six engraved overslips on four plates: [F], [G],[ I], [O] and [R] (2 overslips). Bound in XIX boards, a paper label pasted on front cover. A few old restorations, few spots, overall a good copy from the library of Gaspero Buonsollazzi (signature) and Luigi Battistelli (ex libris). Very rare first edition of one of the finest illustrated books of the sixteenth century. The work is a descriptive guide to the sanctuary of the holy Mount of Vernia, in the Tuscan Apennines, the retreat where Saint Francis received his stigmata on 14 September 1224. 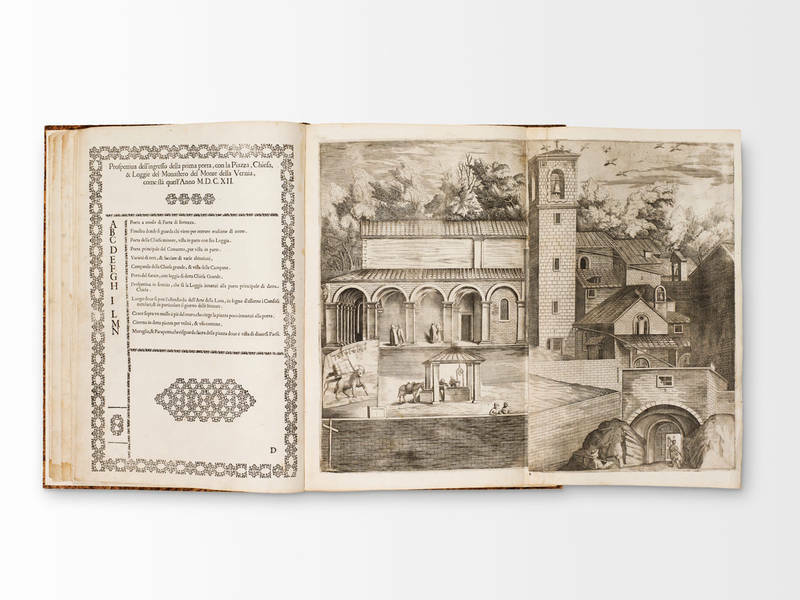 It is the first illustrated treatise entirely devoted to this famous Franciscan sanctuary. The work survives only in a few copies: these precious guides were not meant to be commercialized, but were intended as gifts and homages to important ecclesiastic figures. As stated in the dedicatory letter, in 1607 Fra Lino Moroni, the author of the work, accompanied the painter Jacopo Ligozzi to observe the sanctuary, to have it sketched. The result of this journey was a set of 26 marvellous and detailed drawings, which not only enrich the guide, but represent the main concern of the book. Jacopo Ligozzi (1547-1627) was a Veronese artist active at the Medicean Court of Florence. At that time, he was famous as a painter of extraordinary precision and drawing fineness, and was highly appreciated for his naturalistic illustrations, including both botanic and zoological plates, which are now conserved for the most part at the Uffizi in Florence. Graesse IV.611; Brunet VII.1914; LeBlanc II.214.5-27; B. XVII.242.130-136 (Schiaminossi); TIB.XVII.242.130-136 (Schiaminossi); Michael Bury, The Print in Italy: 1550-1620, cat. no. 41 (The British Museum Press: 2001); L. Wolk-Simon, C.C. Bambach, An Italian Journey. Drawings from the Tobey Collection, 2010, 114-116.